Sadly, there are times when a much loved dog can no longer be cared for. There are many reasons why this might happen. A new baby or change of job means that there is no longer the time to look after a dog. Sometimes a person may simply become too ill or infirm to be able to care for a dog properly. In situations like these, finding a permanent and loving home for the dog is the kindest solution. Keeping a dog when it cannot be looked after properly is unfair to all concerned. 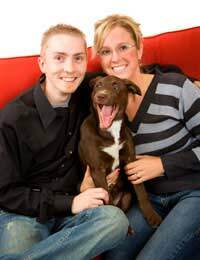 Private adoption – sometimes family or friends may be happy to adopt a dog. They will already know the dog and he will know them so this will make the process more straightforward. The original family will still be in touch and see the dog from time to time which is also a benefit of this arrangement. Advertising – many pet shops offer advertising space in their windows and this can be a good way to advertise a dog. People who are looking at the adverts in pet shop windows are likely to be existing pet owners and as such can make knowledgeable and experienced owners for an adopted dog. Other advertising opportunities include local newspapers and even the vets. It is useful to include a photograph with the advertisement so people can get a good appreciation of the type of dog that is being offered for rehoming. Rescue centres – this might be a last resort for many people, however rescue centres, such as the RSPCA, have an excellent reputation for caring and rehoming pets. There are large support networks attached to rescue centres and dogs who are awaiting rehoming will be given regular exercise and be in the company of other animals. When taking a dog to a rescue centre it is important to provide as much information as possible as this will help to find him a new home. Organisations such as the RSPCA will never put people under pressure to keep a dog that they can no longer cope with and are very understanding of the difficult decision that has been made. There may be alternatives to rehoming dogs and sometimes a little extra help or support is all that is required for a person to be able to care for their dog. Sometimes dogs are rehomed because an elderly or ill person is unable to give them the exercise that they require. Professional dog walkers offer an excellent service and this might be a good solution. Grooming can be another problem for people. Colleges often welcome working with pet dogs. People learning dog grooming, for instance, require dogs to work with when practicing their skills. This can be an excellent way of getting help with grooming for a person who can no longer cope. Asking for help can sometime produce surprising results. Rehoming a dog is a difficult decision to make. Knowing that the dog is going to a new home that will give him much love and care will help people through this distressing and sad time. *UPDATE* I no longer have to re home Kaiser which I am over the moon about as it would have broke my heart!I hope every dog on here finds their forever homes as mine truly has his forever home! Hi there i have a 12 year old staffi cross tan n white called george and due to a job change i need to rehome him sadly this has not been an easy choice ..he is micro chipped neuterd and is well behaived he is great with kids i have a teen and a 4 year old he is wery at first with other dogs as he was atracked by a sharpea 4 years ago n is shakey at first but then ok ... can any one help please. Hi I have a beautiful 8 year old staffie that needs a new home due to my stepdaughter having a baby it's her dog but she doesn't want him anymore and his name is Tyson great with people not with other dogs he has been neutered and chipped we rescued him as he was going to be put down we have had him for 2yrs she cannot devote her time for him now he doesn't like being left on his own he was chipped in my name because when we took him my stepdaughter have any id I will be disappointed to see him go but would like help to regime him asap as my stepdaughter doesn't want him and family and friends don't know of anyone interested in taking him please help. Hi I have a female staffie, she is approximately 12 years old, though vets think she acts a lot younger. I am no longer able to give her the care that she needs, due to extremely long working hours. She is a lovely, well behaved, affectionate and playful dog, who just needs someone who can give her the time and attention that she needs. She loves cuddles, long walks and her soft toys. She needs a home where she is preferably the only dog, as she is used to being the only animal at home. Hi I am a proud owner of a 4 year old shar-pei. She is 4 years old and is in need of a new home. Suki is a loyal and loving dog and loves children and adults! However she detests other dogs and cats. As her owner I am sad that I have to rehome her but work commitments for both myself and my husband have changed dramatically this year and I do not want Suki to suffer as a result! She loves company but also likes her own space chilling out. To add to my last post... Sorry I have no idea where to start with rehoming my rescued Thai Dog, and putting her into kennels I feel would only set her back as she is already very nervous with the tendency to growl and snap if felt trapped. I am a single female living on my own with the two dogs... I have tried dog training, behaviour specialist and there have been great improvements, however it is obvious that my other rescued dog that I brought back at the same time is suffering from Lantas (who I have to rehome) up and down personality, as it can be unpredictable and I sadly now have to admit that she would most likely be better suited being the only dog in the house hold. Please, any suggestions, or where to begin??? I am looking to find a good, secure home & owner for my rescue dog Lanta, who I rescued from The Animal Welfare Centre in Thailand Last June 2014. Lanta is a medium sized dog (near to a Collie), Female, age approx 3 years old, who is a loving, clever, obedient girl, who enjoys her food and walks. Once she has had these she is relaxed and enjoys cuddles and the occasional tug of war with an old sock. Her background was that she was found just outside of the forest on the island of Koh Lanta at 18months old, scavenging for food with her 2 sisters, who were then all brought to the Welfare Centre in Thailand. My reason for rehoming her is that due to her past she can be a nervous dog around new people, children and other pets. As I also rescued another older Male dog at the same time and it is now quite apparent that Lanta would most likely need to be the only dog in the household with either a strong experienced female owner or a male owner, a couple would be good but no children. Sadly I feel I can no longer give her what she needs as she still has some work to go... Lanta would require patience, love and nice walks in the park. She has never chewed anything in the household, is fully toilet trained, good off a lead and is more than happy to sleep downstairs in her bed in the kitchen. If you have any other questions please feel free to contact me. This is a unique situation and I will not rehome her to un experienced dog owners. @samwass - I am sorry to hear this. But if you did not want to rehome him there are ways that you can train your dog not to suffer from separation anxiety. There are many helpful online websites that can give you tips and ideas, such as giving him a lot of exercise, hiring a dog walker in the day, please see Blue Cross link here. If you really can't keep him, then I suggest you have to just go with your instinct. Make sure you have a good chat to this man first. Perhaps you could even break your dog in gently and start asking him to take him for a few walks and get to know him. You'll know too how your dog reacts to him i.e if your dog starts growling every time you see him, then it's perhaps not the owner for him. I hope this helps. Hi im rehoming my 3year old jack russell due to issue he has with been left alone it was my last option and im heart broken. I have a gentleman with previous dog experince who is very interested. I was wondering if anyone can tell me what i need to be looking for in this person and there home. I dont want to give him to someone who may not be right. I have a4 month old staffie who is loving and great fun. But unfortunately has become to boost rouse for my 6 year old Pom Maltese. Her name is coco and she is sandy and white. We have a lovely Shih Tzu that needs a loving home! He is 2 years old and vaccinated etc! Free to good home!